2016/12/28: Tcl3D-Basic available as part of the BAWT framework. 2016/11/03: Demo of the Month for November 2016 has been released. 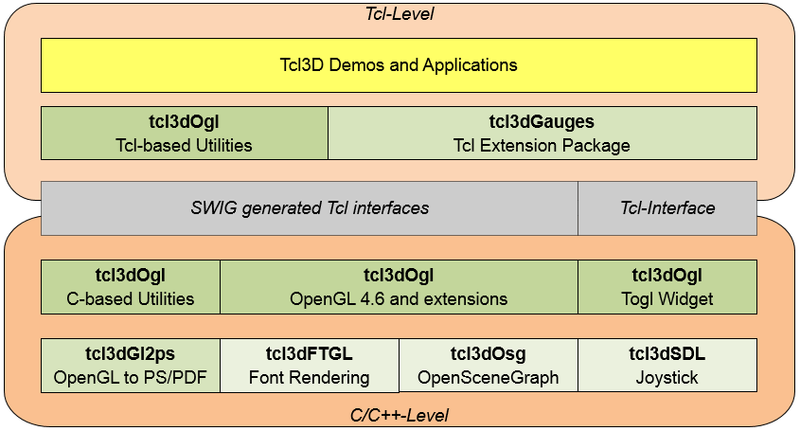 Tcl3D offers the 3D functionality of OpenGL and other 3D libraries at the Tcl scripting level. This is accomplished by wrapping these libraries with the help of SWIG. The Tcl3D package is copyrighted by Paul Obermeier and distributed under the 3-clause BSD license. Some of the wrapped libraries have differing licensing conditions. See the modules documentation for detailled license information. Tcl3D is available on SourceForge. tcl3dOgl Enhanced Togl widget, a Tk widget for displaying OpenGL content. Wrapper for core OpenGL functionality and OpenGL extensions. Tcl3D utility library: Math functions, standard shapes, stop watch, demo support. tcl3dCg Wrapper for NVidia's Cg shading language. tcl3dSDL Wrapper for the Simple DirectMedia Library. tcl3dFTGL Wrapper for the OpenGL Font Rendering Library. tcl3dGl2ps Wrapper for the OpenGL To Postscript library. tcl3dOde Wrapper for the Open Dynamics Engine. tcl3dOsg Wrapper for the OpenSceneGraph library. tcl3dGauges Tcl3D package for displaying gauges. Copyright © 2005-2018 by Paul Obermeier. All rights reserved.